and died (and buried) at McKenzie Island Ontario. 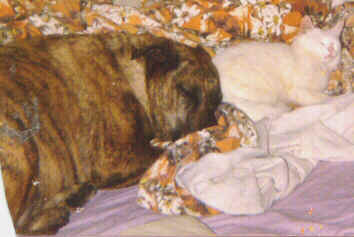 Gunna is shown above with his best buddy Sahara, they were inseparable. he did not meow or know how to jump or do a lot of normal cat stuff. baby and I used to sing, "You Are My Sunshine" to him all the time. and bacon for breakfast and loved chicken so he would only eat chicken cat food. he was a dog, and was afraid of other cats! and got stuck in an old garage. he needed and I miss him a lot. slept and ate together all the time. It was like Sahara knew he wasn't right in the head.